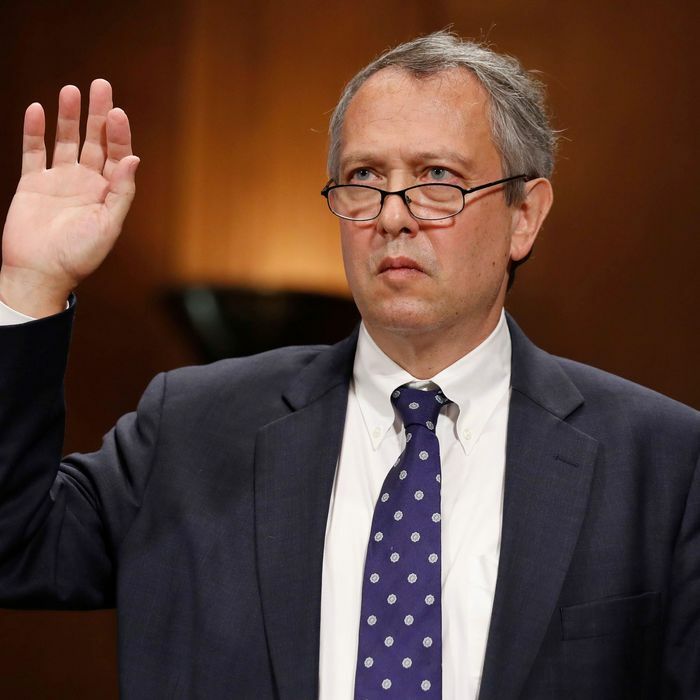 Senator Tim Scott announced on Thursday that he would oppose the judicial nomination of Thomas Farr, who President Donald Trump had tapped to become a United States District Judge for the Eastern District of North Carolina. The news ended a suspenseful four days of deliberation for Scott, whose decision cited Farr’s past efforts to undermine black suffrage. His opposition — paired with Arizona Senator Jeff Flake’s — effectively killed Farr’s bid, which would have secured the Raleigh-based lawyer a lifetime on the federal bench. “There’s a lot of folks that could be judges in states throughout the nation, including North Carolina, besides Tom Farr,” Scott told reporters earlier this week. Farr’s abysmal record on black voting rights is well-documented. As a lawyer for United States Senator Jesse Helms — who, in 2001, Washington Post journalist David S. Broder described as “the last prominent unabashed white racist politician in this country” — Farr was the “coordinator” of a racist 1984 “ballot security” initiative spearhead by the North Carolina GOP. It included a “postcard mailing to voters in predominantly black precincts which was designed to serve as a basis to challenge [them] on election day,” according to a 1991 Justice Department memo. The cards featured an endorsement for Helms — who was running for reelection that November — and the instruction, “address correction requested,” so they would be returned if undeliverable. As Farr explained in a later meeting with Helms’ 1990 reelection campaign managers and consultants, a postcard’s return qualified as prima facie evidence that a voter no longer lived at the residence. This made the voter’s eligibility vulnerable to challenge on election day. But when the state legislature changed this rule in 1985 so returned mail was no longer sufficient grounds, Helms responded in 1990 with even more underhanded tactics. His campaign sent 125,000 mailers to black voters falsely claiming they were barred from the ballot box unless they had lived in that precinct for at least 30 days, and would face jail time if they voted. The result was his successful reelection against then-Charlotte Mayor Harvey Gantt, a black man. The DOJ recommended the North Carolina GOP be sued for its conduct that November. But Farr’s efforts to thwart black voters continued well into the 21st century. In 2013, he represented the Republican-controlled state legislature defending a voting law that a federal appeals court eventually overruled, saying it had “[targeted] African-Americans with almost surgical precision.” The law imposed stringent voter ID requirements, curtailed election day registration and early voting, and ended other procedures favored by black voters, according to the New York Times. Tellingly, legislators had enacted the law almost immediately after the U.S. Supreme Court gutted the Voting Rights Act that year, allowing several North Carolina counties to change their voting laws without federal “preclearance” for the first time since 1965. It should surprise no one that none of this was disqualifying for the Senate GOP. On the contrary, the vast majority still backed Farr’s nomination, with only a handful besides Scott and Flake signaling their reservations in light of his record. This is a feature of modern conservative politics, not a bug. The moral stench engulfing Republicans’ efforts to suppress nonwhite votes is detectable from Georgia to North Dakota. But black political participation has alarmed racist white North Carolinians for far longer. Though it prompts ID laws, early voting restrictions, and roll purges today, 120 years ago, this fear sparked the deadliest race riot in state history. “The ultimate goal [of the 1898 Wilmington riot] was the resurgence of white rule,” historian LeRae Umfleet wrote in 2005, according to the Times. Efforts to suppress black political power may have been bloodier before, but they are not new. The legacy Farr would have advanced on the bench — and the GOP support he amassed en route — is enough to sour any relief generated by his narrow failure. That black North Carolinians have endured such a history only to have Republicans subject them to a man like Farr is remarkable, and even more so considering said history’s enduring relevance. Anti-black voter suppression may have narrowed its scope and obscured its intentions in light of strengthening civil rights legislation of late, but for decades, its most effective means — physical violence — was sanctioned gladly by a kleptocratic white elite. Alfred Moore Waddell used this to his political advantage in 1898. A reluctant secessionist who opened a law firm in Wilmington after serving in the Confederate army, Waddell embarked on a career in politics as the effects of Reconstruction were growing increasingly apparent around him. Black emancipation paved the way for black suffrage, which in turn led to the empowerment of Republicans, the party that facilitated most black political gains during the period. Waddell spent years as a congressman, but by the time he ran for mayor as a white supremacist Democrat in 1898, he and many of his fellow white Wilmingtonians had become furious with biracial rule. That November, Waddell won a dubious election marked by his supporters stuffing ballot boxes and intimidating black would-be voters. According to the Times, Democrats insisted control of the city be handed over to them immediately instead of waiting for an orderly transfer of power. Republicans demurred, so Democrats rioted. A mob 2,000-strong rampaged through the city, firing on black neighborhoods and other perceived Republican strongholds, shooting black people in the street, and forcing black leaders into exile. Other black residents fled into the surrounding swamps to hide. Pregnant women gave birth to babies who died shortly after, unable to withstand the autumn chill. Estimates vary, but state officials say as many as 100 were killed, none white. Waddell, backed by armed men, successfully demanded the resignation of the city’s entire board of aldermen, including the mayor, and took office in what historians describe as the only successful coup d’etat against a local government in American history. The fear that drove Waddell endured. North Carolina’s black population share has fallen dramatically since the era of the coup, from 49 percent in 1897, to 44 percent in 1900, to 26 percent in 2000, to just over 18 percent today. But the progressive resurgence and ballot access reforms that helped Barack Obama carry the state in 2008 spurred Republicans to tighten their grip on power, using means both brazenly partisan, racist, and anti-democratic. The GOP’s redistricting efforts in 2010 paid special attention to North Carolina, gerrymandering the state so ruthlessly that, in the 2018 midterms, Democrats won just three seats in the U.S. House of Representatives to Republicans’ 10 — despite the parties garnering a comparable share of the statewide vote (48.3 percent and 50.4 percent, respectively). Since May 2017, federal judges have deemed no fewer than two GOP-led redistricts in North Carolina unconstitutional due to their racism. Republicans’ 2013 efforts to restrict ballot access, aimed unambiguously at black voters, preceded a dramatic power grab targeting the state’s Supreme Court, which became majority-Democrat in the 2016 elections. The state GOP went so far as to abolish partisan judicial primaries in a likely effort to split the Democratic vote, to trying to end judicial elections altogether. These efforts failed, and voting-rights attorney Anita Earls was elected in November anyway, increasing the Democrats’ state Supreme Court majority to 7-2. This history should matter when considering a nomination like Farr’s. The racist and anti-democratic urge that propels efforts like those he spearheaded in 1984 and advised in 1990, on behalf of Helms, further delegitimizes the electoral process and should be disqualifying. In reality, it is often rewarded. Georgia’s gubernatorial race saw suppression architect Brian Kemp claim victory after seeking to disqualify black voters and refusing to recuse himself from oversight, as secretary of state, in an election where he was a candidate. That Farr came up short attests to Tim Scott’s brief flirtation with morals, as his party’s only black senator. But that may not matter in 2019, when Republicans control two more senate seats and Trump can re-nominate. A key difference is that Kemp can be voted out in a few years. Farr’s judgeship would last until his death. The significance of a lifetime appointment is its name. Black North Carolinians may be used to such incursions from Republican officials by now. But they deserve better, and always have.